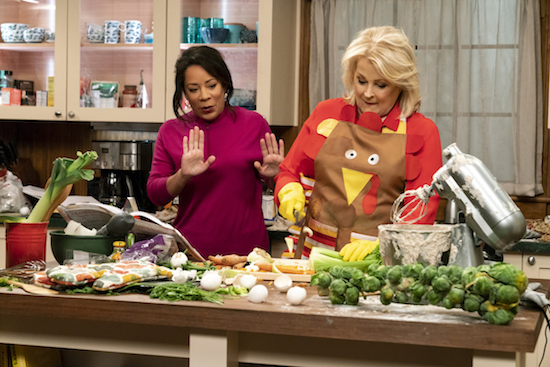 Can Murphy Brown pull off Thanksgiving? "Thanksgiving and Taking" - When the culinary-challenged Murphy invites her colleagues plus Phyllis, Miguel and his parents (Valente Rodriguez and Selenis Leyva) for Thanksgiving dinner with her and Avery, they all brace themselves for the worst, on MURPHY BROWN, Thursday, Nov. 22 (9:30-10:00 PM, ET/PT) on the CBS Television Network. Pictured L-R: Selenis Leyva as Maria Gonzales and Candice Bergen as Murphy Brown Photo: David Geisbrecht/CBS ÃÂ©2018 CBS Broadcasting Inc. All Rights Reserved.